The decor at Thai Taste* hasn’t changed much from previous tenants Mi La Cay and Nava Thai — tired checkerboard linoleum, basic tables and chairs, a few new paintings and Thai artifacts on the walls. There’s nothing wrong with the slightly dive-y atmosphere, in fact it is quintessential Wheaton, and we’re glad the restaurateurs are focused more on the food than the appearance. The trick, though, is to serve food good enough to overcome the atmosphere. Thai Taste succeeds, at least to some extent. As with most local Thai spots, the menu is long, and many dishes at TT are different from what’s on offer at Ruan and Nava. Naturally, we stuck with the familiar; I like to think I am adventurous, but in truth not always on the first try. For me, the best dish was the appetizer of grilled moo yang (pork) skewers, wonderfully charred, served with a delicious spicy-peppery-tamarind dipping sauce. Pad kee mao (aka drunken noodles) is above-average, smoky noodles in a spicy-sweet sauce with peppers and onions, nothing exciting but tasty and well-executed. Thai Taste’s massaman curry falls somewhere between Ruan and Nava — it is rich and peanuty, but not as much (or as complex overall) as Nava’s exemplary version; it falls too much on the sweet end of the spectrum for my taste, though not as much as Ruan’s. It looks great, a large portion of dark beef and sauce in an oblong white saucer, and the beef is disintegratingly tender. We also tried the ped pad kaprow (crispy duck), because I am a sucker for kaprow, and this version is unique (in my experience) in that the duck is breaded and deep-fried, and served in a lighter sauce with many more vegetables (broccoli, peppers, onions, etc.) than usual. It’s pretty good, although for leftovers it ends up too soggy, but I prefer Nava’s non-breaded, darker-and-spicier sauced version, where the duck is rendered to crispness in its own fat rather than relying on breading and a deep-fryer. 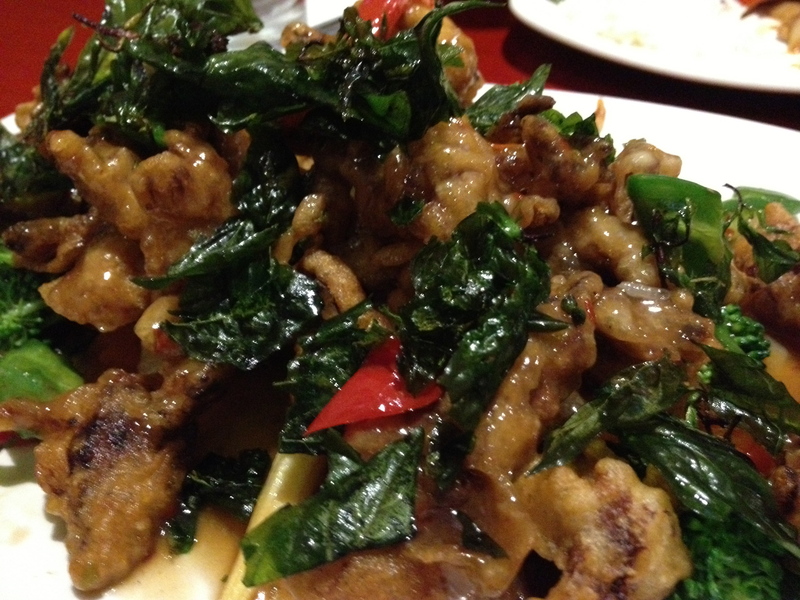 TT’s kaprow does come with a LOT of fried basil sprinkled on top, which we liked a lot. So many menu items we didn’t try, including about a dozen soups that I imagine are excellent, various noodle and seafood dishes, unusual Bangkok street food items (stewed pork leg, steamed pork or fish balls), and a bunch of desserts. They didn’t have any mangoes, otherwise Mrs. Me would have tried their mango sticky rice. Oh well, we’ll just have to go back. Overall, based on a single visit, I would say Thai Taste seems just about equal to Ruan and Nava in quality, but we’ll need to branch out and try some other dishes to be sure. One area where TT beats its neighbors is on price: most main dishes are $7-9, compared with $10-13 at Ruan and Nava. Those standbys used to be cheaper, and TT may also raise its prices sooner rather than later, so I would say now’s the time to go there and gorge on relatively inexpensive, good, authentic Thai food. By the way, service was excellent, friendly and they’re clearly working hard and happy to be there. The full name is Thai Taste by Kob — the chef is Phak “Kob” Duangchandr –and they claim “healthier and tastier Thai food” although I’m not sure breaded/fried duck qualifies as “healthier”… They spent years in Silver Spring, but SS’s loss is Wheaton’s gain. We weren’t surprised to find good food there; that Hung Phat back room keeps spawning great restaurants. As good (and as varied) as Nava Thai’s regular menu is, I am happiest when they offer massaman curry as a special. Nava’s version is delicious and authentic, with fatty beef in dark rich peanut-anise-cardamom gravy, with potatoes. Ruan Thai always has massaman (“Mussa Mun” on their menu, I think) and it is in our regular rotation there, but it isn’t as authentic as Nava’s — too sweet, not enough fat or exotic spicing, or any discernible peanuts. Still good, but not as good. In all my years of Nava dining, dozens of visits (including takeout), they’ve only had massaman curry twice. Could be purely user error: I might just not go on the right days. Recently, though, they had another special I’d not seen before (again, maybe I’ve just been missing it? 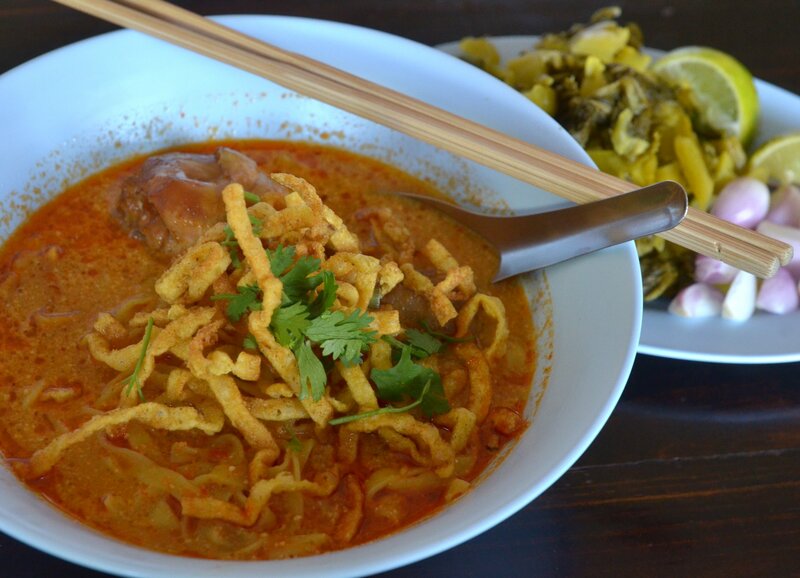 ), the northern Thai khao soi noodle curry soup. I think this is also an authentic version, though perhaps not as robust as some. Then again, there are many different variations on khao soi — see these beautifully photographed entries on Austin Bush’s website, for example. The Chinese might call it “Curried Rice Noodles Two Ways” — the main ingredients are boiled rice noodles, fried rice noodles, and chicken in a curried coconut milk sauce. Usually there are shallots or green onions, too, and cilantro. Since I had read about khao soi but never eaten it before, I was eager to try Nava’s version, and I liked it a lot. The curry sauce was nearly as rich as the massamun sauce, and the flavors were explosive (though I admit adding a little extra hot chili). The only trick was that the boiled rice noodles were bungee-like in their springiness, splattering sauce all over the table and a little on me. I don’t think I doused Mrs. Me at all. I still prefer the massaman, but I would gladly order either dish whenever available. And if they are on offer on the same visit? I will order them both and eat the whole thing. I will probably order two of each and take some home. Because that’s how we roll here at Chez Me. 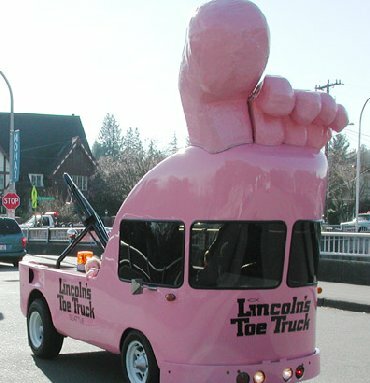 For decades, Seattle has had the famous Lincoln’s Toe Truck, bright pink with a giant set of toes on top. After some years of actual towing service, it ended up sitting on top of a building downtown and now finally has a home in the awesome, rebuilt/relocated Museum of History and Industry. * As a kid, whenever we drove down I-5 to visit the Seattle Center or other destinations involving the Mercer Street exit, we excitedly looked for the toe truck. Kids loved the toe truck. Adults loved the toe truck. It made towing seen fun and silly. * MOHAI is right on Lake Union and if you’re hungry after museuming you can get fish tacos from a taco boat (like a food truck, but on water!) that pulls right up to the lakeside walkway as seaplanes take off over your head — I didn’t try it when I was there last year and still (mildly) regret it. Next time. Towing seems less fun and silly when you park at the wrong end of the Ruan-Ren strip mall in Wheaton (on Amherst off University). As we were leaving last night, one of our Ruan servers was running around the restaurant asking if anyone owned the SUV that was in the process of being towed. Nobody seemed to – the owner could have been at Ren’s, or…Brother? Anyway, we emerged from Ruan to see the SUV hooked up to the tow truck, ready to go. We just avoid that whole parking lot on principle, between the towing danger and the difficulty and awkwardness of getting a spot to begin with. Park on Amherst at a meter, or in the Metro garage across University. I’m not overall a big fan of towing companies, I think they are predatory and in many cases an overly expensive and logistically difficult solution to a minor problem. But in this case, I had little sympathy for the SUV owner, because both Ruan and Ren have multiple signage about not parking at the other end of the lot, to a comical degree. Except apparently not comical enough, because still some people have not gotten the message. This post was meant to be funny, but it was 100% true about not parking in front of Alex, or the store on the other side of it whose name I can never remember. So the towing incident was the lowlight (someone’s lowlight, not really ours); the food was good as ever. We tend to order the same stuff at Ruan over and over again, pad prik khing and mussamun curry, etc etc. Both Ruan and Ren were doing good business, always nice to see, especially at a time of year when people aren’t necessarily out and about as much.